1913 Luton Hoo Inventory, p. 20, no. 77 (the set of four), in the Library. These statuettes appear to be based on late-seventeenth-century Augsburg, larger originals. Compare for example three statuettes of Hercules, Omphale and Venus by Abraham Drentwett II, Augsburg, circa 1695-1700 (L. Seelig, Silber und Gold, Augsburger Goldschmiedekunst Für die Höfe Europas, Munich, 1994, p. 232, figs. 46.1-46.3.). 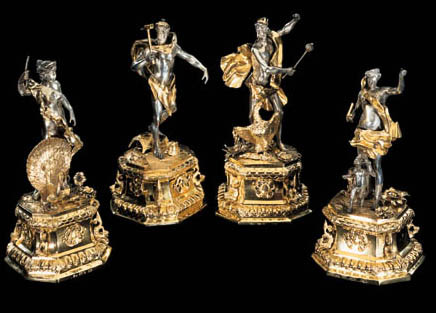 A pair of statuettes of Minerva and Jupiter also by Abraham Drentwett II, 1700-1705, are similar in size to the present examples and are in the Gilbert Collection at Somerset House, London (T. Schroder, The Gilbert Collection of Gold and Silver, Los Angeles, 1988, pp. 573-575, no. 155). Schroder, quoting Hernmarck, notes that such figures were often made as mounts for elaborate furniture, but, given their bases, it seems more likely that they were envisioned as independent sculptures (loc. cit. ).